The place where you can find out all the stuff you wanted to know about SHU's Digital Commons site. "With SelectedWorks faculty profiles, the library collaborates with authors to create compelling online scholarly identities, share scholarship, and measure impact" (Bepress, 1999-2016). 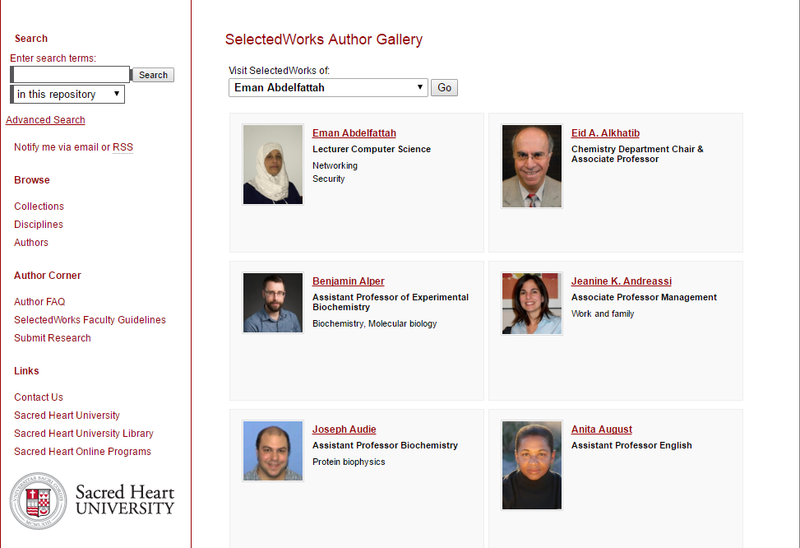 As a faculty or staff member, you may create a SelectedWorks page. Your site compiles your information and scholarship in one place with options to upload materials or link to other sites that contain your work. There are additional features that enable you to customize and personalize your SelectedWorks site. 1) Request to have a site created for you. Email your citations to Beverly Lysobey. When the staff creates your site, they conduct copyright research on your works to determine whether full text can be uploaded. 2) Create the site yourself. Go to works.bepress.com. Click on the green Start button and follow the instructions. You must have copyright permission for any full text content you upload.